UPDATE: Let's say Boy didn't think it was as sweet as I did. Oh well. 4 Responses to "LOVING. LIVING. SMALL. 's RE-DO OF LIGHTING KITSCH"
I used to keep my christmas tree up all year. 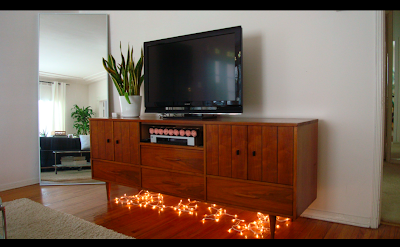 While I do love the idea, I'm worried that the credenza is too high off the floor. Perhaps if you somehow attached them loosely to the underside...maybe it would create a warmer glow. Who knows....just my opinion. Yea, I like the idea too but agree with Nicholas. 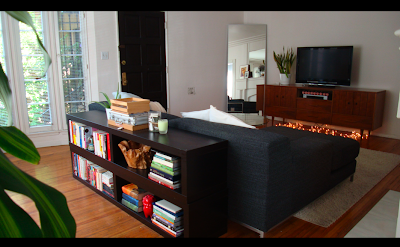 The credenza is a bit too high. Plus Boy came home from work and, well, kinda laughed. It was a cute laugh but still, the lights were turned off. :) Gotta choose your battles - right ladies?